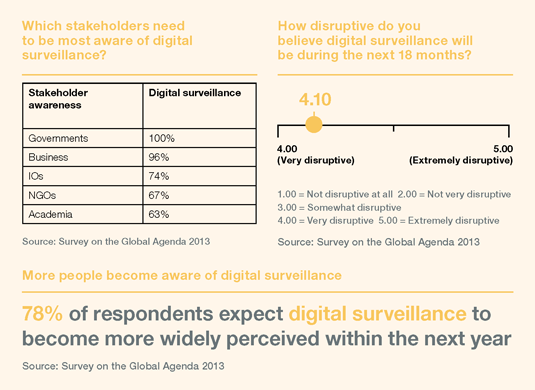 How does digital surveillance fit within a world of increasing transparency? Big Data has fundamentally changed our relationship with information and called into question established expectations of privacy. Our personal information and online behaviour has become a commodity to be analysed and marketed to a degree that few users of electronic media appreciate,and with virtually no controls. As a former intelligence officer I am no stranger to electronic surveillance, but I fully understand that ordinary citizens are uncomfortable with this phenomenon. We now live in a world of Big Data and unlike in the past, the technologies that enable this are almost exclusively in the hands of the private sector. It should come as no surprise that governments have sought to keep pace with these developments to ensure national security or to pursue national advantage: there are many malevolent actors who use the internet and other electronic media for nefarious purposes including criminality, sabotage and terrorism, and governments need to be able to counter such activities. But they need to do so in ways that command public confidence: there needs to be clarity about the reasons for governments to access Big Data – though not the ways in which they do it – and transparent and verifiable processes for ensuring that such access is not abused. I doubt whether any of my former colleagues in the intelligence community would have a problem with these propositions. will accept some constraints on their freedom in return for feeling safe. As for the use of electronic media for state-on-state espionage, this is simply a function of the human condition and is unlikely to ever change. States that feel disadvantaged will just have to adopt better communications security – and perhaps invest more in their own intelligence capabilities. Concerns about security and privacy should not obscure the very real benefits the internet has brought about. And for all the current talk of threat and risk, we should bear in mind that so far nothing too bad has happened in the cyber domain. But the pace of development has taken us all by surprise and we need to start thinking through the implications of where we now find ourselves in a more systematic – and democratic – way.